Can you really get a decent active five-string for £600 and change? A fully-specced bass at a low-midmarket price point - quite a coup. Excellent build and player-friendly features. None, although tone range could be more impressive. “An active five-string for £600?” your grandfather used to say, refilling his pipe. “It can’t be done, lad!” In fairness, his generation had to suffer through an endless wave of low-quality affordable basses that fell apart after three months, long before the phrase ‘CNC router’ was whispered among bass cognoscenti. Now, all these years later, a Cort GB series has fallen onto BGM’s doormat, ready for review thanks to the company’s UK distributors Proel Ltd. Let’s fire it up and prove the old fellow wrong... or right, as the case may be. Pick the Cort BG75 up and examine the quality. From the elephant-ear Hipshot tuners on down, this bass is all about size and presence, thanks to the 47.5mm nut width and the 35” scale. Thankfully it doesn’t have a two-octave neck or we’d need two people to pick it up, let alone play it - and its flattened C profile and slippery finish means that navigating said neck can be done without the need for GPS. The body, a transparent red stripey job made of swamp ash, is set off nicely by the transparent scratchplate, an option that we wish more luthiers offered. We’ve got two pickups, a single-coil job and a big old humbucker, to play with, modulated by four gold pots, knurled and heavy like they used to make. Very impressive. Quality is at front and centre, unusually at this price point, with a cunningly rounded-off bolt-on neck joint, a truly massive bridge called the Omega (presumably because that sounds imposing) and neat touches such as a flip-out battery compartment on the underside. The truss rod is accessible, there’s a string tree on the headstock to keep things tidy and the overall balance of the beast is perfectly acceptable. So far, so good. Cort’s ‘Voiced Tone’ pickup range are represented here by an Alnico V magnet-equipped humbucker, paired with a single-coil unit. Select passive mode via the push/pull volume pot and the tone is a touch anaemic; without boosts at either end to give it character, the sound is polite rather than pulsating. That may serve your needs just fine, of course, but the BG75 really comes alive in active mode, so do take the time to investigate. The bottom end is most impressive, with a bull-like roar added to the tone. Apply it with care - thank you, whoever at Cort decided to give the controls a central detente - or you’ll overdo it. Conversely, the treble is merely adequate, so consider other options if you need a tone that will shatter a pint glass at 100 yards. Pickup selection isn’t really an issue; the humbucker is so obviously the more powerful of the two that you may never roll it off. Do so, though, and the single-coil does its job well if predictably. Extra clarity and precision comes from the bigger pickup, so check out the various gradations of tone with the blend control. The playability of this bass is outstanding, thanks largely to the ergonomic neck joint, rounded towards the lower bout. This gives you extra access to the higher frets, in particular 17 to 21, which ring out clearly when you’re doing your Jaco-style pinch harmonics. The neck profile and finish help you move along with alacrity, too. The benefits of economies of scale aren’t necessarily skewed towards large business owners, we would venture to remark, thanks to the expertise gained from our failed O-Level in Economics. 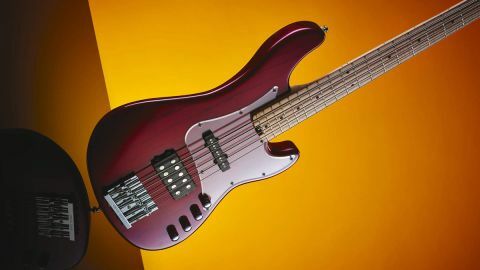 For example, when a massive company like Cort, who operate out of a veritable metropolis of a factory out in Indonesia, focus their efforts on creating a range of features-packed basses for a relatively small outlay, the end user wins. For £619, they’ve made a bass that has a) five strings b) a 35” scale c) active electronics d) a player-beneficial design e) high-quality hardware f) woods of reasonable quality g) excellent hardware h) a useable, if unspectacular, tone range. What more do you really need?